Why are you just now advertising this? I've known about this mobile site for at least a year now. I have it bookmarked on my phone. This thread is actually over a year old. Does anyone uses it, lol? 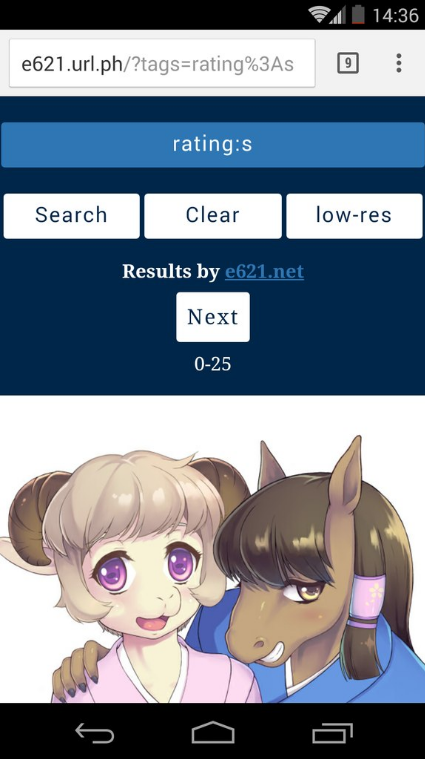 uh this site already has a built in mobile application, the only thing i done really like about it is the inability to favorite posts and stuff. Wait, comrade. First I thought that your site would work perfect as proxy/anonymizer (e621 is officially blocked in Russia), but it loads without images. Like this. Is there possibility not to request e621.net which is unreachable in our Ust'-Perduysk city? Is this permanent? I was using it and was quite happy with it. You mentioned before that you don't want to insert placeholder text to the search box because it would require some JS and tinkering around. I'd recommend to use an HTML5 solution instead. Simply set the input field's placeholder property and it will display the text specified if the field is empty and the browser used to display the site knows HTML5. I don't log in on this website, but had to today. You're doing gods work, cuberope. This mobile website version is great. Its really useful for tablets. And even in PC, for gallery downloading purposes. I see you have trouble maintaining it online, don't desist! The Crumby app also works well, but I appreciate your work. Ok, I just wanna say, I wish I could've seen this two years ago! This has been very helpful so far. I wish I could see comments without having to go to the link though. Also, the search bar looks like a decoration. Maybe add a magnifying glass symbol? Or default text as was previously said. Or perhaps make it a cream/white color instead of blue. Just suggestions, keep working on this please. It's absolutely amazing so far. Is there something wrong with the site? Can't open it in mobile or reg. Is it me or is it dead again? Yeah, would like to see it stay, too. The fullwidth pictures just make it perfectly viewable on a mobile device. e6 current mobile page just seems way to cluttered and full for small screens.